This is a short report about a fabulous few hours on the Farmington River. I'm going to let the photos tell the story and toss in a few words here and there. When I got there fish were rising, but none were taken a dry flies. "Mini-Buggers", white in particular seemed to attract. I'm going to name this "Klags Run"...Adam does it look familiar? A couple of these today, this one fought like a steelhead. The pretty lady ran, jumped, ran, and battled to no end. Notice the barbless hook, it held. I can't say enough good things about these hooks, a report on them coming soon. This is how the CGR 5'9" 3wt looked all morning. A tasty morsel to some. Interesting tail on this one. It was good this day...more to come. Good morning folks, hope your enjoying your cup of morning "joe" as much as I am, I have Green Mountain Nantucket Blend and it's doing its job nicely. Here we are on the brink of July and still looking for some substantial rain to help put some flows into the streams. I have been fishing the Farmington as well as a few ponds to keep my casting arm in shape, but the urge to visit a small stream was to strong and I paid a visit to one yesterday. I was going to fish a stream in Massachusetts and from previous visits there I thought it would be holding water. My arrive time was around 6am and when I stepped out of the Honda I was very surprised at how cool the air felt. I had on a long sleeve shirt, but truthfully could have used a fleece jacket. I got my sling pack and rod and headed to the stream. One of my first sights was the beauty of the laurel, it was still in bloom. Walking further I felt the pine needles underfoot, I said to myself "this is how man should feel when walking". The sound of water could be heard, and it was not faint. The stream was visible now and looked to be in fine shape. I was going to wet wade today and stepped into the water to give it the "toe test", cold indeed. I dropped my thermometer into the stream and it confirmed my toes reading...cold..the temp was 58 degrees. Wet wading would be kept to a minimum. I fished the stream and found many willing brook trout. I was very excited about hooking a few, now if I could only bring one to hand. The fish were very lively and I fished a long time before I brought one to camera range. These fish were small 3-4 inches. I don't know if that's an issue with what they have for food, or a good crop of young fish. 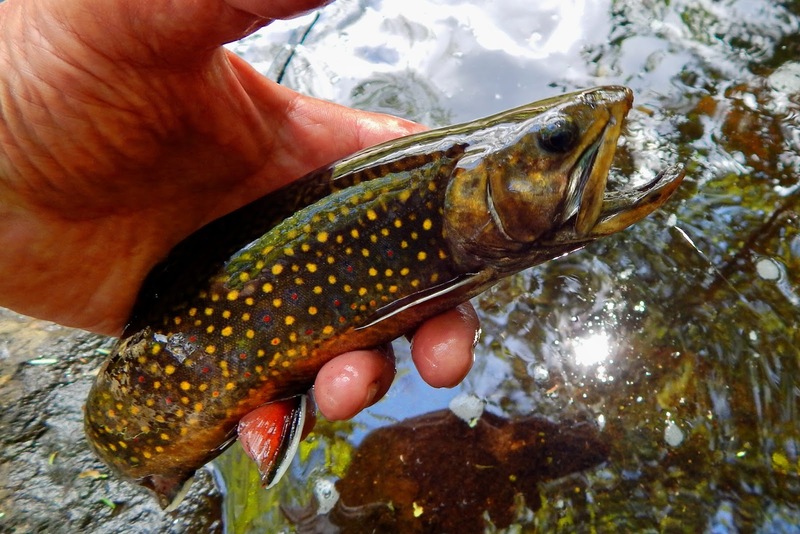 Hey brook trout fishing on a small stream is what I went for and so I was going to enjoy it. I came upon several spots as this. Deep pools with a fast run of water flowing in. It's places like this that usually give up some bigger fish, and this one lived up to just that. The fly twisted in the currents and the trout struck. I was soon putting my hand in the water and lifting this jewel up. Yes Alan there are bigger fish in this stream. A quick photo and a thank you and back she went. Well now my small stream fix is complete and thoughts are of ????? I received an e-mail from a gentleman who lives in Ohio. He's a follower of my blog and finds the streams I fish as well as the fish themselves to be some of the most beautiful he has ever seen. In Ohio so much of the fishing is warm-water and to see our streams is such a pleasure. His question was do the streams dry up, and how do the wild trout fare through the seasons. My reply to him was this. 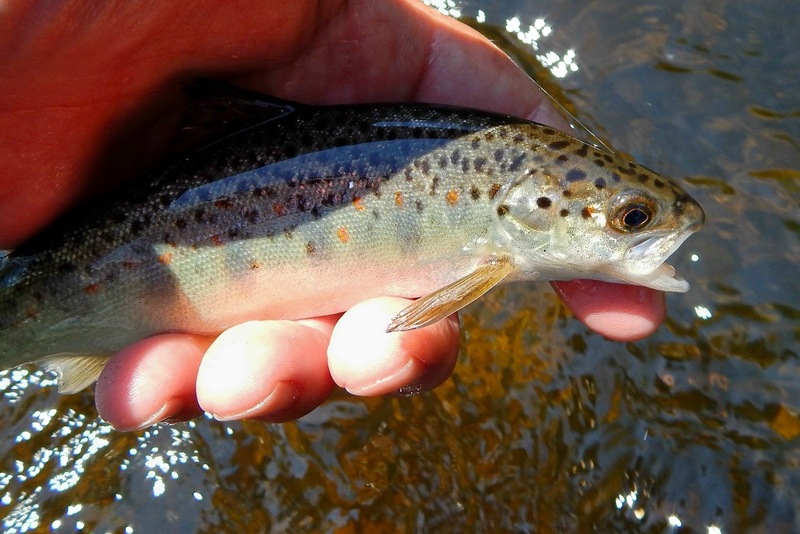 The trout survive because the streams they live in do hold up well enough to sustain them. The waters flow through deep shaded valleys. The also have springs that seep up through the stream bottom providing cool water. Most of the streams also have some pretty deep plunge pools which provide oxygenated water as well as cover from natural predators. Below is a series of photos of the same stream through the seasons, that is Autumn, Winter and Spring. "Leisenring Spider" And "Little Olive Dun"
Looking at various sites and came across these two good looking patterns. I tied them up with relative ease and with few materials. This pattern was created by Pete Hidy. It's called "Leisenring Spider"
Hook- Allen D102BL #14....Thread, Yellow....Body, Hears Ear Dubbing....Rib, Gold Wire....Hackle, Brown Partridge. This pattern is "Little Olive Dun" created by Mark Libertone. 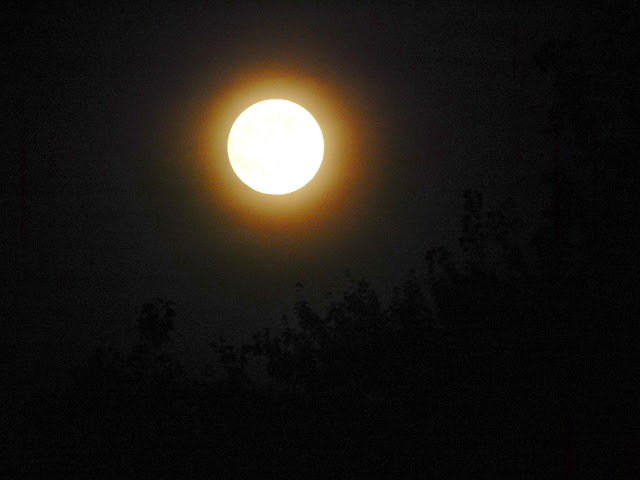 After last nights big full moon today was a day to spend a few hours fishing. I arrived at the river at dawn. There was a bit of an overcast-fog as I walked to the river. The fog did not last and the sky as well as the river were brilliant. 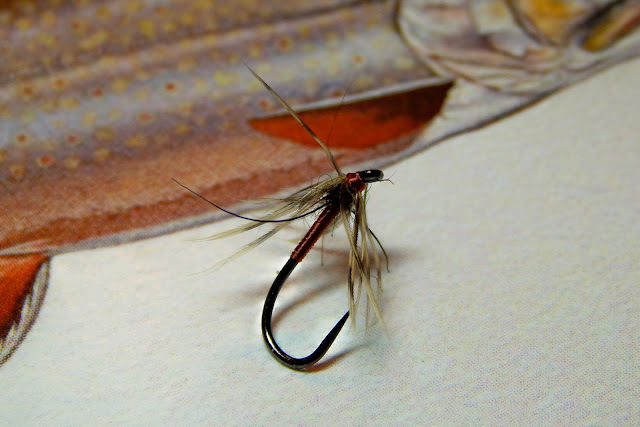 I started out with my soft hackle combo which is one light fly and one dark fly. Giving the fish some variety and usually they tell me what they like. This morning they liked the dark fly. Fished just under the surface it took several nice fish. Wild brook trout, and wild brown trout slammed my soft-hackle. This was a little fighter..leaping multiple times, and leaped out of my hand as the camera finished clicking. The sun was high and bright and that signaled my time to leave. I'm not saying, but they were delicious....you guess. Well folks I spent a few hours today fishing the Farmington River. Inspired by my brother-in-law John, who sent me the photo your viewing first, and Pete, aka "TROUTI", who fished it the other day. The day could not have been better weather wise. The river was a bit high for my liking but I adapted. The first spot I fished seemed almost perfect, a slight break in the water a few large boulders and some caddis about. I had a small nymph and a soft hackle. A half dozen casts and I was into a fish. He was on and soon off. Good start none the less. In that run I managed two more hook-ups and dropped them both. The Farmington is big water and can be frustrating, but an angler must press on. My first fish to hand...a wild brook trout that took the nymph. I was seeing the best and the worst this river can throw at you. There were fish rising, and I had a few on. One a nice rainbow who showed some awesome airborne tactics. And there were those wonderful brook trout. They seem to always make the day. 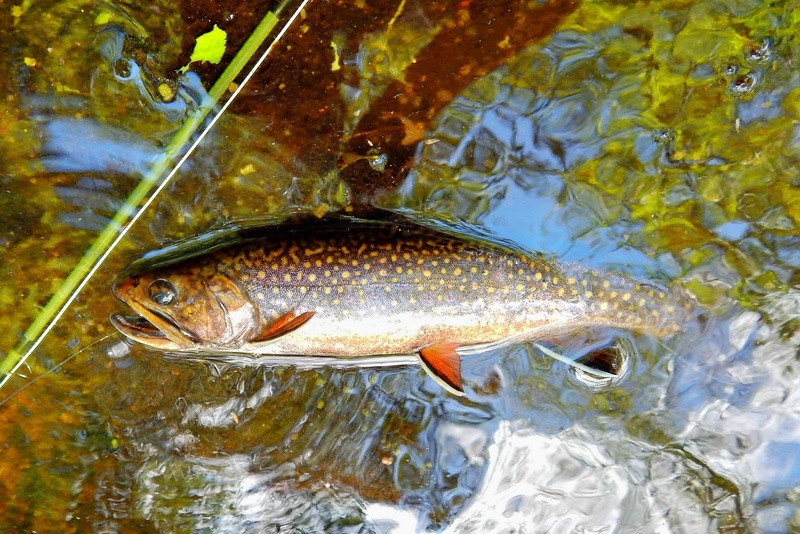 How beautiful is this...a Farmington River wild brook trout. All in all not a bad few hours on the river. I have a couple of recipes I'd like to share with you. They both are pretty simple and are real delicious. As with most recipes there is more time used in the preparation with these one has almost no prep time and the other requires a little more time, but well worth it. The first one is a breaded pork cutlet. Pork is very cheap and it's lean. Purchased sliced thin then taken home and pounded out so it's real thin. Four eggs are beaten, and in another bowl bread crumbs flavored with your favorite spices, please don't buy seasoned bread crumbs, buy plain or visit your bakery and buy the brad crumbs there. In a fry pan pour in oil and heat. Dip pork into bread crumb then dip in egg and drop in bread again. Place beaded cutlets in oil and cook until golden brown flip over and do the same on side two. When cooked place on paper towel then place on a plate. It can be served with noodles, or rice. I enjoyed mine with a fresh ear of corn. This is one of the most enjoyable venison dishes I make. The whole family loves it. Take 1-2 lbs of deer meat cut into one inch cubes or maybe a little smaller. Take some seasoned flour and dredge deer in it. In a hot fry pan pour some oil in it and place the deer cubes anf ry until you get a nice brown on them. Remove from pan and place in crock pot. Now you'll need about 6 carrots cut in serving size pieces, one celery stalk cut the same, one small onion diced. Put the vegetables into the fry pan and swirl them around in the deer drippings. Pour in a quarter cup of water and deglaze, then put it into the crock pot with the deer. In a small pot put in a cup of water, bring to a boil and add three hand fulls of pearled barley, stir and bring back to a boil. Cook barley until almost all the water is absorbed and add to crock pot. Season the soup with whatever seasonings you like. A couple of shots of Worcestershire sauce is mandatory. You can add two small cans of beef broth cover and cook on slow for eight hours. Sunday Kirk and I got together to fish a couple of small streams. Kirk is due to have some surgery on his foot and that surgery will not allow him to wade these little waters for about a month. We met at stream 1 about 7-8 am and after a game plan we started fishing. I started with an ant and Kirk with a muddler. After about a half hour I had nothing and Kirk managed 3 good brook trout. We moved downstream and I settled in a lovely pool that had trout rising and Kirk went further down. I started fishing the ant and no takers..they were still rising. Several fly changes...and no takers, several more fly selections...and no takers, but they were still rising. Frustration was taking hold and I could not figure it out. Selective brook trout in a small stream..how could this be. I finally tied on my smallest offering a size 18 Jassid...second drift and wham fish on-off that was the battle. 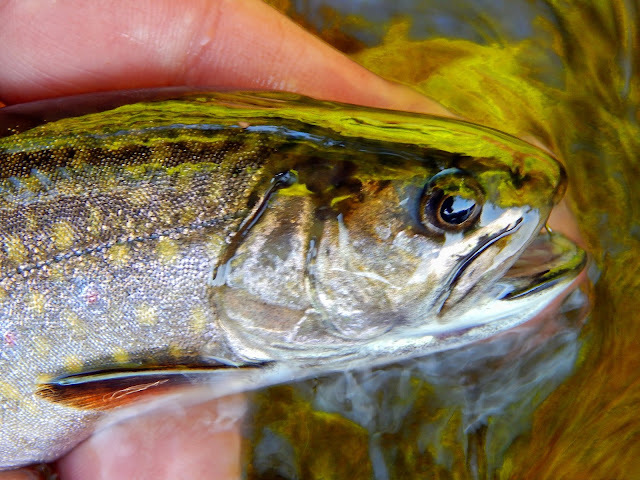 Several more drifts and hookup, nice fight and a brookie-selective brookie to hand. I figured it out and another to hand. Then looking at the fly or what was left to it and that was the end of that series of success. I worked downstream to find my way to where Kirk was fishing, all the while not doing well as far as catching is concerned. Kirk was close and said he had several more brook trout seduced by the muddler. The decision to head to stream 2 was made and I was happy...new water maybe better luck. This wild one fooled by the Jassid. We stopped for a spell to enjoy a cup of coffee, this store has a coffee blend that is tops. I also battled to bring from memory of a maple syrup place in St. Johnsbury VT that I wanted Kirk to visit....."Kirk the name of the syrup store is "Maple Grove Farms" check it out it's wonderful". We arrived at stream 2 to find it in great shape. We fished it and had some luck, mostly Kirk that is. We both agreed that this stream has the most beautiful brookies in Connecticut. An hour or so and Kirk had to leave, and I had to stay and fish. In the small pools and runs of this stream my day was made. This wild male brook trout slammed a fly, danced and darted trying to get free. He finally gained his freedom after a photo or two. Frustration was a bad memory, flies will work, and brook trout will come to hand. Those soft-hackles again. I have compiled many of the flies I've created and I'm putting them in order. This is being done mostly for my use so I have an idea what's going on instead of boxes of flies without any idea of what they are. I'm going to name the patterns by numbers, rather than giving them a fancy name. The numbers assigned to them are not according to how productive they are they're just numbers. Most of these flies are simple and I'm confident on their fish taking abilities. This will be shown over the months to come. Each fly will have it's materials listed for those of you who would like to tie some and give them a try.